I had been hearing that Tony Scott (Deja Vu, The Fan) was in talks with Warner Bros to re-make The Wild Bunch. About a thousand Rolaids later and it looks to be, hopefully, stalled. The last internet mention of this project was August 2011. I have a list of films that, in my humble opinion, should never be re-made. Top of the list was True Grit (1969) and of course the Coen Bros re-made it and (he said grudgingly) they did a pretty good job. The big number two on my list is The Wild Bunch. Director Sam Peckinpah (Bring Me the Head of Alfredo Garcia, Straw Dogs) made a truly iconic western with The Wild Bunch. His story of a band of outlaws trying to cope with the modernizing of the west was brilliant, touching and bloody. But more than anything else, it was a last’ hurrah’ for Sam. I think it is the best film he ever made and that’s throwing Ride the High Country into the mix. Both films were autumnal westerns, but each were autumnal in different ways. The Wild Bunch was made in a small Mexican town that agreed to hold off getting electricity until Sam finished filming. I learned this little bit of information from a featurette on blu-ray edition of the film. The ‘making of’s’ on the DVD were damn near as good as the film. 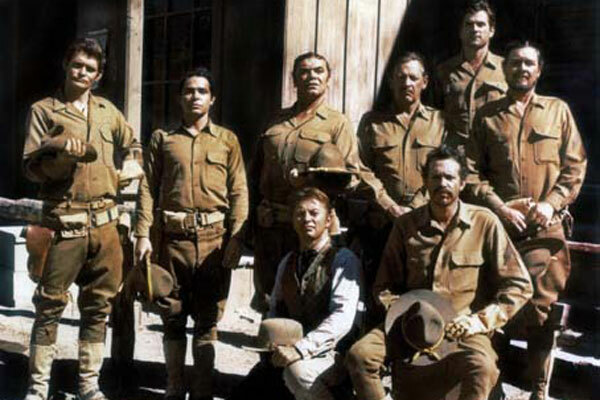 William Holden (as Pike Bishop), Robert Ryan (as Deke Thornton), Ernest Borgnine (as Dutch Engstrom), Ben Johnson and Warren Oates (as the Gorch brothers), Edmond O’Brien ( as Freddie Sykes) and Strother Martin and L.Q. Jones as two of the rag-tag group of bounty hunters. The film opens with the Bunch robbing a bank. Unbeknownst to them, a special posse of bounty hunters put together by Railroad man Mr Harrigan (Albert Dekker) are waiting; scattered through the town in hiding spots. This is all happening against the backdrop of a Temperance Revival Meeting and Parade. When the Wild Bunch leave the bank, timed to coincide with the parade passing in front it, (they’ve spotted the posse), the bounty hunters open fire. The resulting gun battle ends with scores of towns people killed and injured and very few of the intended targets hit. *Just a quick word about character actor Albert Dekker. Dekker had a long and diverse career as an actor. The Wild Bunch was his last film. While the film was being edited, Dekker was found in his locked apartment in his locked bathroom, dead. It was very suspicious and unfortunate (Dekker was engaged to be married). The details of his death has been recounted in Hollywood Babylon II Kenneth Angers gritty book about the ‘dark’ side of Hollywood. Back to the fiim. The outlaws notice that the person apparently leading the posse is old gang member Deke Thornton. Thornton had been caught and put in prison, This was his chance to ‘go straight’ by helping to catch the rest of the gang. The rest of the film follows the outlaws and their flight from the posse. We get a bit of back story on Pike and Thornton. More importantly we learn that this group of outlaws have a code. We also learn that the posse does not. Peckinpah shows repeatedly that in the class system of the old west, the posse are the ‘dirtbags’ of that era. The posse seem to be made up of ‘hillbillies’ who scratch and claw for the spoils of their freshly killed targets. The outlaws on the other hand, seem almost dignified, even the Gorch’s. The Wild Bunch gained notoriety when it first opened for the amount of blood spilled in each gun battle. Actually blood spurted would be a better description. The bloodshed combined with the slow motion almost balletic death scenes led to many critics panning the film outright. 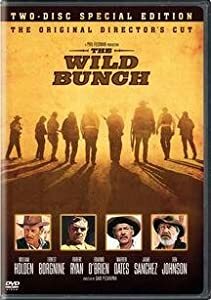 I would recommend to anyone that The Wild Bunch be seen at least once. Preferably the director’s cut. Once you have seen this breathtakingly original film you will wonder why on earth would anyone try to re-make perfection. Interesting… do you have recent information about a this project of a remake of the wild bunch… And do you also heard of some information about the project of The cowboys (John Wayne) by Tommy Lee Jones ?.. He speak nothing about that in the last french Festvial of Cannes.